The Municipal Authority of Westmoreland County was created by resolution of the Westmoreland County Commissioners on April 9, 1942 and celebrated its 75th year in business in 2017. The drinking water system of the Municipal Authority of Westmoreland County was developed over the past 75+ years through the strategic acquisition of established systems and planned water line extensions to accommodate growth. In 1943, MAWC acquired Citizens Water Co. In 1950, MAWC acquired Westmoreland Water Co. and Vandergrift Water Co. and started planning to build today's Beaver Run Reservoir. McKeesport's Water System was purchased in 1987. As a result of these and other acquisitions and expansions, the service area as now comprised extends approximately 25 miles from east to west and 40 miles from north to south and incorporates over 2,400 miles of pipeline. 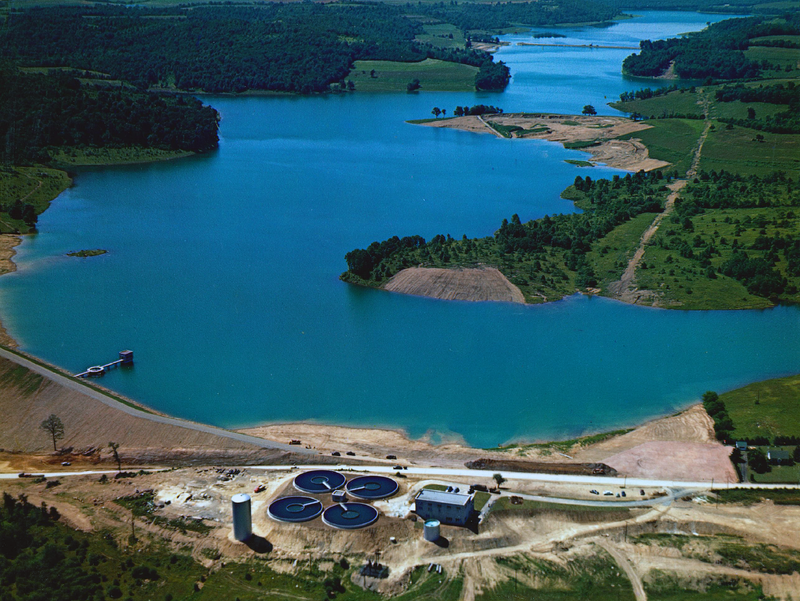 The Beaver Run Reservoir was constructed in 1952 and then enlarged in 1962. It has a present capacity of 11 billion gallons and a safe yield of 45 million gallons of water per day. The Youghiogheny River is the other principal source of supply, with a drainage area of 1,326 square miles and a minimum flow of 213 million gallons of water per day. The Indian Creek Supply Filtration Plant, located near the City of Connellsville, has a rated capacity of 40 million gallons per day and draws its water supply from both Indian Creek and the Youghiogheny River and serves the southern portion of the MAWC service territory and the North Versailles area. This facility was constructed in 1973 and was upgraded in 1979 and again in 2017-2018. The McKeesport Filtration Plant, located in the City of McKeesport, was completed in 1990 with a rated capacity of 10 million gallons per day. The McKeesport Plant draws its water supply from the Youghiogheny River and serves the McKeesport, White Oak and Port Vue portion of the MAWC service territory. The George R. Sweeney Water Treatment Plant is located at the Beaver Run Reservoir in Bell Township. This facility replaced a smaller filtration plant and went online in July 1997. Upgraded in 2015, it has a rated capacity of 24 million gallons per day. This facility serves the northern portion of the MAWC service territory. In 2012, the MAWC completed an interconnection to the Greater Johnstown Water Authority, allowing it to decommission its Furnace Run Water Treatment Plant. The Ligonier area is now served by water treated by GJWA from its North Fork Reservoir. The MAWC also sells bulk water to Duquesne, Monroeville, and Plum in Allegheny County; Belle Vernon, Pennsylvania American and Pleasant Valley in Fayette County; and Parks and Gilpin in Armstrong County. The wastewater system now serves Jeannette, Hempfield Township and the Boroughs of Penn, Youngwood, Ligonier, White Oak, and Avonmore, as well as parts of the City of Greensburg, East Huntingdon, North Huntingdon, Penn, Sewickley, and Unity townships.